Over the past 18 months we have explored the applications of ultrasound for the detection of breast cancer. In hand-held ultrasound the quality of the images is highly dependent on the operator’s skill while the procedure can take up to 45 minutes to perform, and these limitations have led to the development of automated breast ultrasound, or ABUS. A recent publication suggests that the Holy Grail of breast cancer screening — 100% sensitivity (percentage of true positives) while simultaneously yielding 100% specificity (percentage of true negatives) — may be within reach. 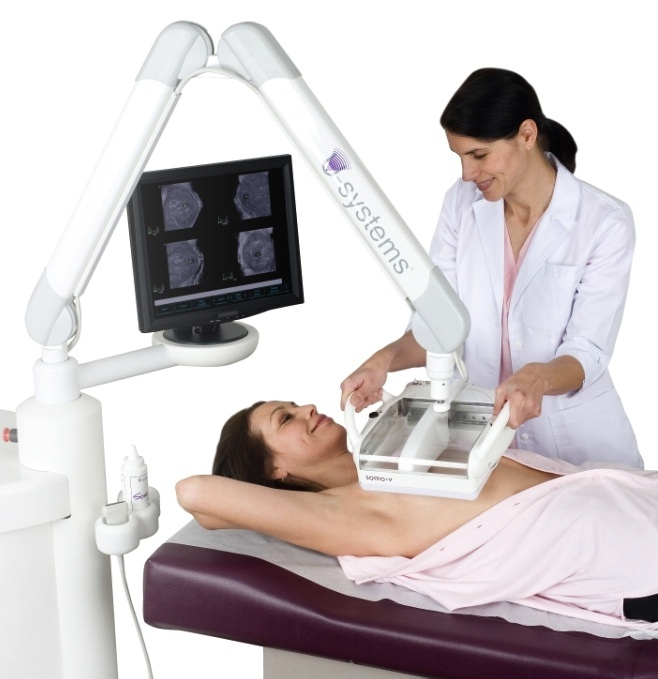 In the May edition of Clinical Imaging, Vincenzo and Concetto Giuliano of the Breast Cancer Research Institute in Florida published an article entitled “Improved breast cancer detection in asymptomatic women using 3D-automated breast ultrasound in mammographically dense breasts.” While their purpose was quite straightforward — to justify the cost-benefit of the judicious application of ABUS in conjunction with digital mammography for women with dense breasts — the implications of their findings could have profound consequences. Their experimental design included two study groups, the control and test groups, in successive years that were followed prospectively for one year. The control group consisted of 4,076 asymptomatic women, all of whom had breast density of 50% or greater as determined by the full-field digital mammography (FFDM) system manufactured by Hologic. The test group consisted of 3,418 asymptomatic women who also had dense breasts, where FFDM was followed by ABUS evaluation using the Somo-V device from U-Systems (now a subsidiary of GE Healthcare). The Somo-V ABUS device. Copyright U-Systems. In the control group the sensitivity and specificity of stand-alone FFDM were 76.0% and 98.2% respectively, with a cancer detection rate of 4.6 per 1,000 patients. All cancers were biopsy proven invasive ductal carcinomas. In the test group, who had FFDM followed by ABUS, the sensitivity and specificity were 97.7% and 99.7% respectively, while the cancer detection rate was 12.3 per 1,000. The findings would appear to be clear-cut: far fewer cancers will be missed if ABUS is added to digital mammography when screening women with dense breast tissue. There are still challenges that need to be addressed before FFDM plus ABUS becomes a widely adopted screening approach. Because ABUS generates 3D data there are many images for the radiologist to evaluate, researchers are developing computer-assisted detection algorithms to shorten the process, while at CapeRay we are building our Aceso model that combines the two imaging modalities in a single platform. Wow! “the Holy Grail of breast cancer screening — 100% sensitivity (percentage of true positives) while simultaneously yielding 100% specificity (percentage of true negatives) — may be within reach.” This is even better than having the path specimen and doing histology and electron microscopy! Anyway, a specificity of 99.7% is a red flag for, well, shall we call it enthusiasm? Cancer has so many mimics – eg radial scars – and so many apparently benign guises that macroscopic imaging can never be fail-safe. You’re quite right, David, that macroscopic imaging can never provide the definitive diagnosis. That will always be the domain of the biopsy specimen and microscopic imaging. Under separate cover, I will send you a PDF copy of the paper by Vincenzo and Concetto Giuliano, and I look forward to your comments.